The mission of Quilts of Honor is to bestow a universal symbol and token of thanks, solace, and remembrance to those who serve in harm’s way to protect and defend our lives and freedoms. Quilts of Honor are made by the loving hands of countless volunteers who wish to thank those who have served so that they know their sacrifices are appreciated. How can you help? NotJustQuiltZ and Color Me Quilts coordinate the Niles chapter of Quilts of Honor. 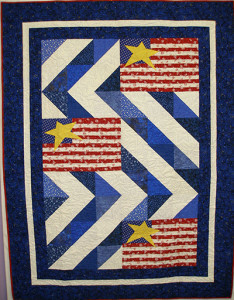 Both are drop-off points for red, white and blue fabric, completed quilt tops, and completed quilts. Or you can come in on special “Quilts of Honor” quilting days to help put together kits, quilt tops, pillow cases, bind quilts, put on labels, etc. 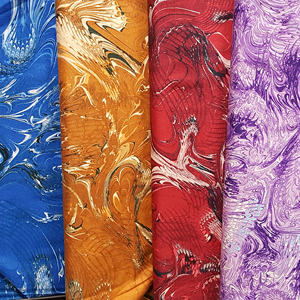 Check our calendar frequently to see when we’re having a sew day or call either NotJustQuiltZ at 510-797-6579 or Color Me Quilts at 510-494-9940 to leave your name and number for us to call you when we are planning our next sew day. Everyone can help. 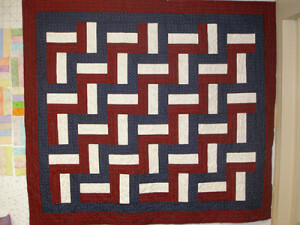 “I have had three quilts quilted at NotJustQuiltZ. As any quilter will tell you, handing someone else your quilt and trusting them to do a good job with it is not always easy. I can honestly say that I was very pleasantly surprised at the quality of the work. My quilts are beautiful!